A group of protesters walk into Parliament grounds on 22 March 2011 after marching from Cape Rēinga, New Zealand's northernmost tip, to protest against the Marine and Coastal Area (Takutai Moana) Bill. The banner at the front reads 'Maori Seabed For Shore! ', an obvious pun on the marchers' concern over Māori ownership of the foreshore and seabed. 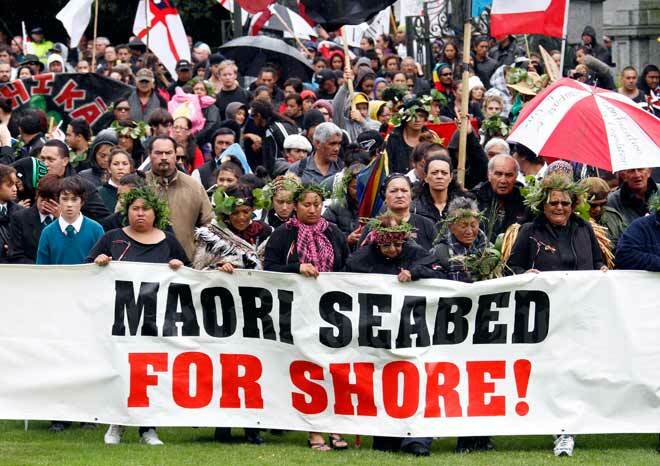 The hīkoi (march) echoes the massive hīkoi of 2004, when the Labour government legislated to restrict the ability of Māori to claim customary rights to the foreshore and seabed.